The greater Mossel Bay area abound in specialty shops and venues where arts, crafts and a wide variety of exclusive items can be obtained. Follow the Mossel Bay Arts and Craft Route and return home with wonderful gifts for friends and family, or a great memoir of an unforgettable holiday! Start the route inside the Bartolomeu Dias Museum Complex at the museum shop, where a variety of museum souvenirs - including miniature hand made caravel's - are on display. Moving down the green slopes of the Museum grounds pass the Old Post Office Tree, one finds the historic Munro's Cottages - built in 1830 by Alexander Munro and today of the oldest buildings in Mossel Bay and a national monument. The buildings today houses a Cottage Shop, where visitors can browse through interesting hand made arts and crafts and enjoy refreshments at the picturesque tea garden overlooking Munro's Bay. Adjacent to the Museum Complex is the not-to-be-missed Ochre Barn - the building dating back from the early 18th century when it was first used as a warehouse, then a trading post and later owned by the "African Golden Ochre" Company, who exported ochre from Albertinia via Mossel Bay, to England. The Ochre Barn houses hidden treasures such as antiques, shells, gemstones, handmade jewelery and exquisite diamonds, leather products and a definite highlight - the Model Ship Company - one of its kind, where replicas of early vessels are handcrafted with meticulous care by local craftsmen. On route from the Ochre Barn one passes through Liberty Lane, where the smell of fresh grounded coffee and delicious home baked delicatessens hang in the air. On display are hand made fabrics, fresh flowers, pottery, hand crafted gifts and beautiful shells from the hidden treasure cove of the ocean. The beauty and the calm atmosphere of Mossel Bay provide artists and crafters with the inspiration they need to produce first-class work.Finding them - and meeting them in their galleries, shops and studios - is part of the fun. You haven’t seen Mossel Bay until you’ve been to Mossel Bay Art Gallery. Come view top South African Art. Relax on comfortable couches with a cup of coffee while the sound of classical music soothes away the daily stresses. The Dias Museum Complex houses the 500 year old Post Office Tree, Maritime Museum, Shell Museum and Aquarium and a life-size replica of Bartolommeo Dias’ Caravel. Tel: 044 691 1067. Adrenalin sports include quad biking, parachuting, hiking, bungi jumping, abseiling, surfing, sailing and deep-sea fishing. Tandem Skydiving. Tel: 082 824 8599. Endless beaches and surfing hot spots. Sand boarding. Tel: 082 971 1405. Wave Rider – Jet Ski’s, speed boat. Tel: 044 590 5397. Shark Cage Diving: Tel: 044 691 3796. Big 5 game viewing in malaria free environment, Botlierskop. Tel: 044 696 6055. “Back road Safaris” and Township tours. Tel: 044 690 8150. The Craft Art Workshop. Tel: 044 691 1761. Sandstone architecture such as the Pavilion at Santos Beach. St Blaize Lighthouse circa 1864. Historical Walking Route. Tel: 044 691 2202. Golf – ‘see the sea from every tee’. Tel: 044 691 2379. Whale watching on board the Romonza. Tel: 044 690 3101. Casino. Tel: 044 606 7777. This open air mall, with hints of the town’s maritime history is situated literally just off the N2 and en route between Mossel Bay and Hartenbos on the Garden Route. The Mall greets you with the smell of an ocean breeze and blue skies which will instantly put you in a relax mood and shopping will be just so much easier! Shopping at the Langeberg Mall is hassle free with ample open and free basement parking. On offer is a variety of shops ranging from nationals such as fashion, food, jewelery, financial services and beauty outlets that will cater for your every need. Indulge in a culinary experience with restaurant chefs creating masterful meals. The speciality shops will tickle your fancy to that special gift or just a memoir to remind you of the special and unforgettable time you had at Langeberg Mall, Mossel Bay. Regular events entertaining the whole family make Langeberg Mall the ideal family outing. Moving down to the Point area, one discovers unique skills and craftsmanship in the Historic Point Bungalows, where an astonishing range of fishing gear and equipment are produced or repaired by local craftsmen. New developments include the quaint Point Village, which has become an extremely popular accommodation venue. Point Village retains the colourful and original "fisherman cottage" style, but with some added value, giving the village a unique style and character. Restaurants along the marina have stunning views of the bay area and are a favourite for both tourists and locals. A must stop is the nearby Surf & Factory shop in Marsh Street, where one can watch the art of surfboard shaping at its best. Every surfboard is a masterpiece for the individual who orders. On route from the Point through Marsh Street, another must stop is the famous Fynbos Shop, named for the wide variety of indigenous Fynbos and flower products from the local area. People visit from afar to experience this haven of hand made gifts and crafts. A wide variety of artists dwell in the country side on the outskirts of town. One such venue is the farm Buffelsfontein, where local farm workers trained in the ancient European art of Paper Machè delight visitors with their skillful methods and beautiful finished products. On the neighboring Muller's Farm, established artist and craftsmen produce and sell their original products in tranquil surroundings. Delicious farm products, farm animals and a tea garden, makes this outing a memorable occasion. From here the route winds to the adjacent village of Hartenbos - boasting the biggest self-catering establishment on the Southern Cape coast with beautiful, unspoilt beaches which draws sun seekers from all over. On display are unique beach wear, beautiful shells and other marine related hand crafts. "De Vijgeboom" - within walking distance from the Hartenbos Museum - is renowned for its home baked cakes and sweets as well as unique hand crafts and it provides the perfect ending to the greater Mossel Bay Arts & Craft Route. A TOURISTS WALK AROUND THE POINT and then THROUGH THE TOWN. This is a replica of the stone Padrao that Da Gama erected together with a large wooden cross made of a mizzen mast. This erection was done whilst fresh water was being collected at Aguada de Sao Bras. These quaint holiday beach bungalows have been in use for more than 50 years, built on land leased from the Municipality. They are the last such holiday bungalows from early in the century still left in the country and are mostly owned by people from the Karoo and Oudtshoorn. There has been an ongoing controversy for years, over their proposed demolition by the Town Council, to make way for an up-market beachfront development. The cottage owners claim a life-right on the stands by virtue of their long use thereof. Scores of tiny children use and enjoy this pool during the summer months while their families look for pretty shells on the beach. The original commonage was bought from the Vintcent Family for the sum of 6000 Pounds. It is now a bustling Municipal caravan park, with 230 sites for caravans and campers throughout the year. Rows of rocky reefs form a natural tidal pool where generations of the town's children learned to swim. Chains and ropes secured across the pool assist swimmers when surging tides cause strong currents to wash down the pool, with waves almost a metre high. At the upper end of the pool there is a diving board over a deep pool with high rocks on the seaward side. This is Blougat (Blue Hole), a very deep pool where local children learn to dive. This Restaurant and Bar is built on the rock foundation of the old Poort Tearoom. The original tearoom stood on that spot for many years until disaster struck early one Sunday afternoon on 13 January l949. A tornado hit the Point and huge waves swept over the area causing great damage. The tearoom was washed off its foundation and about l00 campers' tents and small wooden holiday bungalows on the Common were swept away by the waves. Holiday-makers fled for their lives and it was a strange sight to see suitcases, beds, chairs, tables and other paraphernalia floating about on the sea after the storm. A well-known inhabitant, Mr Attie Hofmeyr and his family were amongst the victims. This Memorial stands on the rock formation known as Frog Rock. It was erected in memory of the men from the town and district who died during the two World Wars, and the wars in Korea and Angola. Stand just outside the wall behind the Memorial and look up towards the left of the Cave. A clear image of Gladstone's face in profile can be seen as formed by the rock edge. This name was given during the first occupation of the area when thousands of bats still lived there. The roof of the Cave is over 10m high, it is 12m deep and 22 metres wide at its mouth. It is certain that the Khoi, or Strandlopers, and San lived in this Cave, at different times, in past centuries. During an archaeological dig in the 1880's an old midden consisting mainly of sedimented shells was uncovered, indicating that early dwellers of the Cave may have lived largely on a diet of shellfish. It was also recorded in a book in 1888 that after removing some two metres of bat guano and dirt, some artifacts were discovered including a well preserved vase of Eastern origin. Looking at the cave from war memorial, from the left, an image of Gladstone's profile can be seen. Some years ago an application for an Art Gallery to be built in the Cave was sensibly turned down by the Council. There is once again a move to "make a better use" of the Cave for the sake of Tourism. The use of light beacons or fires to guide ships dates back to 600 BC. Fires were used on Robben Island before Greenpoint Lighthouse was erected in 1824. St Blaize lighthouse was commissioned in l864. Today all lighthouses along the coasts of South Africa are fully automated, except for only two manned lighthouses, of which St Blaize is one, still operating at dangerous spots. St Blaize has a 500 watt lamp of 250,000 candle power. The light can be seen up to 25 nautical miles (about 45km) out to sea. The foghorn can be heard up to 15 miles (25km) out. In misty weather the foghorn will bellow mournfully for days on end, with a record 6 days of fog in the middle 60s. In stormy weather a huge black basket used to be hoisted to the mast to warn boats out at sea to return to harbour. On a clear day, in the late summer, February and March, one can see the Knysna Heads 30 nautical miles (50km away) to the East. Visitors may visit the Lighthouse and climb the stairs to the top. Permission must be obtained from the Lighthouse Keeper on duty. This quarry provided the stone for the first breakwater built here in the 1850's and again to extend the breakwater in 1898 and again in 1912. The quarry is now a parking lot with a pleasant Braai area. There are evidently plans to build an open air theatre here. The Tunnel Caves. Over the back of the hill. Visits to these Caves was a favourite pastime for generations. As recently as l989 a young Mossel Bay student ventured in there and was trapped by the high incoming tide. His body was found several days later near Great Brak River, some 12 km away. Visits to these Caves are no longer encouraged. Near the Tunnel Caves is one of the most dangerous spots on this coast. At high tide waves smash against the rock face below and shoot up jets of foam and water through a hole in the top of the rock. Anyone who ventures onto this rock to watch the wild surf below is in great danger of being washed off by freak waves. Divers who have searched for bodies in this area report that the sea here is a dark green hue and very deep and cold close to the rocks. This hiking trail of l3 km starts at the Cave runs around the back of the promontory, hugging the edges of the high cliffs and ends at Dana Bay. It is an easy walk through beautiful gorges with lovely fynbos and breathtaking sea and cliff views. Care should be taken as the path runs close to the cliff edges in places. The Old Aloe Works On the hill above the Harbour (Now defunct). Aloes (Aloe Ferox) grow from Mossel Bay to Riversdale in the West, but the juice is mostly harvested on farms in the Albertinia area. The aloe tappers cut the thick aloe leaves and arrange them in a daisy wheel pattern around a hole in the ground lined with a plastic sheet to catch the juice that drains out of the leaves. This juice is then cooked in tins in the veld until it solidifies making for easy handling for export. Aloe tappers still ply their trade on farms in the Albertinia district, where they live in the veld while tapping and cooking the juice in the long winter blooming season. Bitter aloe has been used since the time of the Roman Empire and is still exported to Germany and Japan, where it is used for medicine and cosmetics. The rubble breakwater with a wooden jetty, called Bland's Jetty formed the old harbour called Varkens Baai. The Black Jetty, with steam cranes operating on it came next, then The White Jetty followed with electric cranes. The first breakwater was built in the 1850's and has been lengthened and strengthened several times. Old folks who grew up in the town remember the Fishing Beach, from where the NSRI now operates, using the jetties and tall cranes as diving boards. Rowing Regattas were held in the harbour, which was mostly unsheltered at that time. The first Regatta, commemorating Queen Victoria's 70th birthday, was held in May 1888 in foul weather. In earlier times gales used to cause severe damage to vessels moored in the harbour. In the late 1960's a strong North-West gale struck Mossel Bay and sank three fishing trawlers at their moorings. The longer breakwater and the new Quay 4 now provide much better shelter. The Breakwater was strengthened in 1996 with the placing of 1200 extra "dolosse" against its seaward side and at the end. These "dolosse" are massive 7,5 ton concrete blocks with a special interlocking shape, designed to withstand the action of the waves. The name derives from the Afrikaans word for an animal's knuckle bone, with a vaguely similar shape, used by SA children as a primitive toy. The dolos design is a SA patent, and is used for breakwaters all over the world. Many well-known tugs operated in the Harbour and some of them served during two World Wars. The "Bounty" was named for a descendant of the Bounty Mutiny, who lived in George. The "Kingfisher" stranded on Santos Beach. The "Undine" and the "Mary" played a heroic role during a 2-day hurricane gale in l917. They took several floundering fishing boats in tow and steamed into the gale for 36 hours before the storm abated and they could bring their crippled charges back to the safety of the Harbour. The well-known "Alwyn Vintcent" now serves at the Cape Town Waterfront. Mossel Bay harbour is the 5th largest in South Africa. Classified as a Small Vessel Port it can take vessels with a maximum draught of 7m. The 130m long Quay 4 was built in l972 and the harbour has since been deepened for the Service Vessels used for the Oil Rig. Apart from the yachts at the Walk-on Jetty, fishing vessels and other ships that use the harbour, some 50 oil tankers call at Mossel Bay every year. These vessels use the two tanker moorings (the buoys are clearly visible near the Island) from where they load or discharge oil by pipeline. Since 1995 the harbour has been provisionally on the list of SA Ports of call for touring passenger liners. Last year 8 such liners called at Mossel Bay. From here their passengers toured Oudtshoorn and the Garden Route. However, passengers can only disembark on to the ships' own ferries if the swell is not too high, which is often the case. The NSRI operates two rescue craft from the Mossel Bay harbour, the "Edwin Wassung" and the "Voortrekker". There are 4 crews of about 28 active volunteer members. During the Holiday Season the craft are usually called out 2 or 3 times per day. Many of these calls are false alarms by pranksters who fire off flares. As every distress call must be investigated the crews waste fuel and hours of their personal time on these false calls. Most calls are genuine and the NSRI is often called out because of the sudden storms that blow up along the coast. In the mid 1960's a fishing boat with 8 men aboard was holed by a shark near the Great Brak River mouth. The crew struggled desperately to bail out the in-rushing water while trying to get back to harbour. The rescue craft was just in time to take them off before the boat sank a few hundred yards from the harbour wall entrance. Mossel Bay Yacht And Boat Club - And Walk-on Yacht Moorings. The Yacht Club is situated in Munro's Bay just below the Maritime Museum and is open to members only. The Club has over 600 members, mostly Country Members who use the Club during the holidays. The 60 local members sail their yachts throughout the year, but nearly all the sailing and regattas take place during the summer holiday season, which starts in early September. The Bay is windy enough to make for good sailing but sudden squalls are sometimes experienced. In the late 60s some 17 yachts in a Race were capsized or damaged within 30 minutes of the wind rising. The MBYC had a boat in the 1993 Rio Yacht Race when the "Highgate Ostrich" sponsored by Alex Hooper and skippered by JJ Moorcroft took part. The crew was supposed to have lived mainly off ostrich products. The Club also had a boat "The Good News" in the last Rio Race. The Walk-on Yacht Moorings, built in 1995 within the shelter of the Harbour, provide safe mooring for 48 Yachts. This Walk-on Mooring is now also used by ferries from passenger liners. This island is about 2km from the Harbour and is about l00m long and 50m wide. The Sea Fisheries Department controls the Island and count the seal population from the air at regular intervals. At present there are some 4500 to 5000 seals on the island. No culling is done on this Island any more as the population remains fairly stable due to adult seals moving away to join new colonies. Usual movement is to the West Coast where there is plentiful food. Porpoises are regularly seen in the Bay when they move in long schools past the Point, in mid-afternoon. The fisherman used to make a fishy tasting biltong (dried strips of meat, like American jerky) from their flesh but this is illegal nowadays. Mossel Bay lies almost in the centre of the newly proclaimed Whale Route which stretches from the West Coast to East London in the East. A Whale Route board has been erected at the Tourism Office and the Whale Flag will be hoisted on days when the whales are spotted in the Bay. 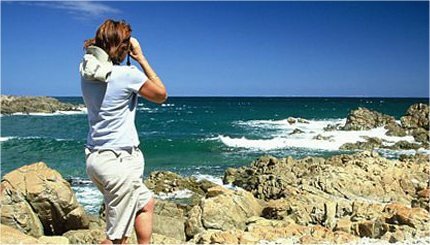 Local whale spotters advise the Tourism Office of the whereabouts of whales in the Bay. This Bay is a favourite shelter for Southern right whales, so called because they were considered the "right" specie to hunt, being of a suitable size and also as the carcasses floated after being harpooned. Every year from about May to October whales visit the Bay, often in schools of 10 or more, mostly near Little Brak River. They seek out the safe and calm waters of the Bay during their calving season. The whale cow usually swims around alone until her calf is born, but is sometimes accompanied by one or more female whales believed to act as midwives. They play together and stay in the Bay for about three months for the calves to grow stronger. The males will join the females only after the calves have been weaned, when mating takes place, before they all return to the Antarctic. Oyster Beds. Along the rocky outcrops of Santos and Bakke Beaches. Mossel Bay used to be famous for its oysters, but is now better known for its tasty local soles. A great many oysters are still harvested in and around the Bay by a few traders with concessions which are very strictly controlled. Private divers may only remove 25 oysters each per day. There are good beds on the rocks at Hartenbos, Little Brak, Reebok and Tergniet areas as well as in Vleesbaai and Fransmanshoek. The Oystercatcher trail near Mossel Bay on South Africa’s southern coast, is among the world’s thirty most spectacular walking trails. Learn the habits of whales and dolphins. Enjoy the eco experience of this educational walkabout - highlighting the habits of the African Black Oystercatcher. Snorkel safely in rocky pools. Visit ancient caves, fish traps and Khoi-San Middens. The Petrified Forest - that was not all it was claimed to be! When an Italian professor on holiday walked along the rocky beach on the north side of De Bakke, he claimed the long rocky rifts to be the remains of a petrified forest. The townsfolk turned out en masse to pick up every stone that could be carried away over that week-end. However after intensive studies the stones were pronounced to be the best limonite concretions of sandstone deposits in the world. The early Farmers used to outspan their animals at the large drinking troughs (water bakke) and the stage coaches stopped here to water their horses before taking on the long haul to the Town of George, or over the mountains into the Karoo. Big iron troughs are still there. For some 40 years a settlement of many holiday bungalows stood at the entrance to the town. The owners were mostly from the Karoo and up- country. In 1970 the Council finally took a firm stand and all huts had to be demolished. The area was then used as a dumping site for building rubble for a long time and when it was finally levelled it provided an ideal site for 49 charming Chalets right on the seafront. These fully equipped chalets are in great demand by local and overseas visitors and are usually fully booked up a year or more in advance. For reservations phone the Council Offices: Tel 91 2215. The Bay has 10km or more of safe, fine sandy beaches stretching from Munro's Bay and Santos beach to Little Brak River. The sea temperature is a comfortable 20 to 22degrees Celsius during the summer months and 13 to 14degrees in winter. Many local inhabitants swim right through the year. There is little danger of sharks in the swimming areas as the thousands of seals provide all the food they need. Santos Beach is named after a German schooner, the "Santos" that sank here. The tug "Kingfisher" and several other small craft foundered here as well. It is a very popular beach especially since the erection of thatched umbrellas. The hardwearing Thatching Reed which grows abundantly along the Southern Cape Coast is used all over the country. There is a clump of thatching reed (female) growing on the corner of the Shell Museum opposite the Spring. Bakke Beach is a very popular beach with families for good swimming in lively waves. There is a dangerous backwash near the rocks on the northern side but the Lifeguards always keep a good look-out.Hartenbos has the longest beach, 5km or longer, with two safe swimming areas. In December hundreds of colourful umbrellas cover the beaches for long stretches. Dias Beach is the place to look for the pretty Pansy shells at low tide. The town is served by 4 Municipal caravan parks - The Point, Santos, De Bakke and Dias Beach where caravans park all year round. These parks are very popular and the sites are booked up a year in advance. There are hundreds of sites, all with electricity points. NO PETS allowed. Hartenbos ATKV Caravan Parks are large well-run parks and accommodate 556 caravans. Bookings are confirmed a year in advance. Tel 044 695 0110. This beautiful Pavilion is one of only two beach pavilions still in use from Colonial times. The other one is the famous Royal Pavilion in Brighton. A local architect of the town travelled to Brighton to get ideas and it was then built in l9l6 by WJR Swart. During the 1920's and 1930's the Pavilion was a social meeting place for the townsfolk who regularly gathered there to listen to the Band and to exchange news and gossip. In l925 the then Prince of Wales visited the Pavilion during his visit to South Africa. In l979 a fire destroyed the roof and woodwork of the building and the remains was nearly demolished. It was later taken over by a private company who restored it and was granted a 30 year lease in 1986. This Power Station was built in l922 to supply the first electricity to Mossel Bay in 1924. For many years the large cooling pond next to the Power station was used as a warm seawater bathing pool by the young folk of the town. There were specially erected cubicles where the grown-ups, mostly from the Karoo, could bathe in privacy in the warm seawater which was considered beneficial to rheumatic and arthritic patients. After the completion of the New Power Station at Little Brak River the Old Power Station became a derelict. The old stone building has been restored and now houses the Mossgas Information Centre next door to Santos Protea Hotel. The Centre welcomes visitors and one can obtain insight into the working programme of the Oil Rig, 84km out to sea. This well-stocked Provincial Library stocks some 30,000 books for adults and children as well as many paintings, records, videos etc. Visitors are welcome to join during holidays on payment of a deposit. There are also Libraries in D'Almeida, KwaNonqwaba Township, Hartenbos, and Great Brak River. The Harry Giddy Park. Top of Marsh Street. It was first laid out in 1887 and called the Victoria Park. The ornamental cast iron gates were donated by Mr. Bruns in honour of Queen Victoria's Jubilee in 1904. The Park was in great demand during the early part of this century when the Band Stand and the Gazebo were in regular use. It then fell into disuse and disrepair. In 1940 Mr Harry Giddy upgraded the Park, donated new gates for the southern entrance and stocked a small zoo with peacocks, cranes, mountain tortoises and monkeys. He laid out a bowling green, repaired the Band Stand and the Gazebo and built the stone walls and benches. The Park was renamed the Harry Giddy Park. The tortoises laid numerous eggs, which were fed to the monkeys until they became so sick of them that they pelted the visitors with them. Children could obtain eggs to hatch out in a warm sandy spot of their gardens. Many Coloured people bought the tortoises for R1 to roast over the coals. The meat is said to taste like tough chicken. The zoo was later removed and the Park restored to its present state. The fountains still flow through the Park, the stone-work is still intact and there are lovely big trees, but the Park is seldom used by the townspeople now. Efforts are being made to regain the interest of the public by holding an Art & Craft Market there occasionally on Saturdays and during the December holidays.